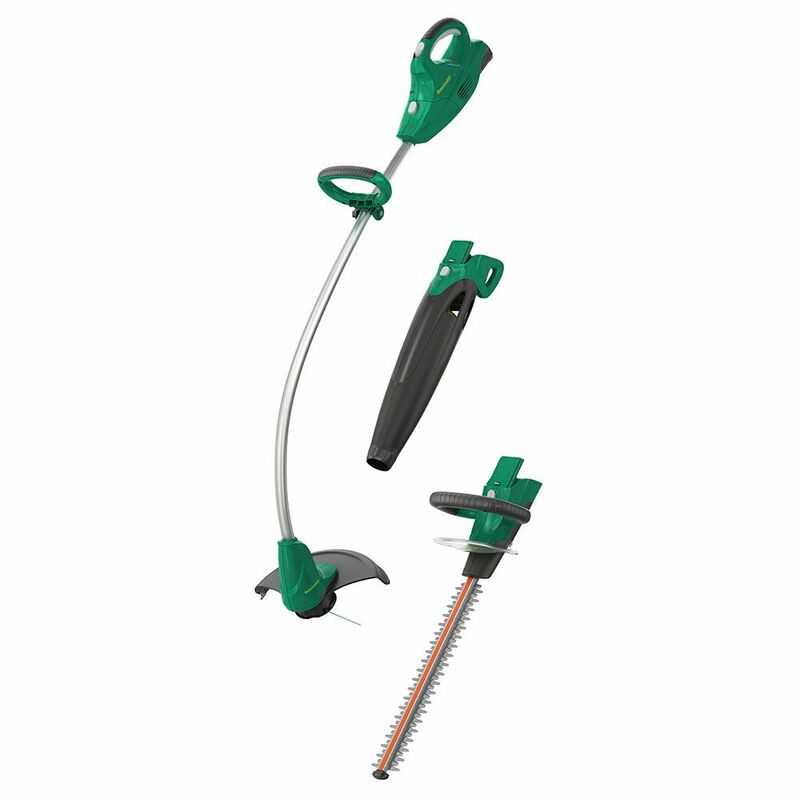 Lawncare is a snap with Weed Eater's new 3-in-1 tool family. It features one interchangeable 20-volt battery-powered powerhead that runs multiple tools (string trimmer, leaf blower, and hedge trimmer). Just pull one attachment out and snap another in, to easily take on multiple lawn care tasks quickly and efficiently. With a hassle-free 20-volt, 2.5 Ah battery, it powers up instantly with the simple press of a button. No pull cords, power cords, gas, oil, or fumes. Each interchangeable tool is compact, super-lightweight, easy to start, and easy to use. Combination pack includes the T100i string trimmer, featuring a 12-inch cutting path and single-line trimmer head that automatically feeds cutting line when needed; our HT160i hedge trimmer, featuring 16 inch dual-action, serrated cutting blades; and the B230i leaf blower, featuring 80 MPH air speed and 250 CFM of blowing force. The 3-in-1 interchangeable combination puts an arsenal of hassle-free tools in your hands. The 20V Max Brushless String Trimmer (Bare Tool) provides precise power control with a variable speed trigger as well as performance and run time management with the High/Low speed control switch. The patented gear drive design will provide more torque and maintain cut speed under load, while the dual-line bumps feed head clears a full 13-inch Well balanced and only 8.5 lbs. (with 20V Max 5.0Ah battery), the string trimmer easy to manoeuvre and puts less stress on the user. Work through the thickest of tangles with this ECHO gas brush cutter. It is lightweight and easy to use and starts quickly. The offset U-handle with stop switch and throttle lock out delivers maximum operational control and user comfort. A shoulder harness is also included to increase your mobility during operation. Part of ECHO's best-in-class X Series line, the SRM-2620U brush cutter redefines performance for professional landscapers. It offers a choice of either a trimmer head or blade (blade sold separately) to handle any clearing task. The comfortable u-handle and shoulder harness allow all-day use with reduced fatigue. The PAS2620's 25.4cc professional-grade 2-stroke engine offers class-leading performance. Rubber-padded handles provide for extreme comfort and vibration reduction. The new lead-in design shaft coupler provides easier attachment of lower ends to the power source. 20V Cordless Multi-Tool String Trimmer, Hedge Trimmer and Leaf Blower Lawncare is a snap with Weed Eater's new 3-in-1 tool family. It features one interchangeable 20-volt battery-powered powerhead that runs multiple tools (string trimmer, leaf blower, and hedge trimmer). Just pull one attachment out and snap another in, to easily take on multiple lawn care tasks quickly and efficiently. With a hassle-free 20-volt, 2.5 Ah battery, it powers up instantly with the simple press of a button. No pull cords, power cords, gas, oil, or fumes. Each interchangeable tool is compact, super-lightweight, easy to start, and easy to use. Combination pack includes the T100i string trimmer, featuring a 12-inch cutting path and single-line trimmer head that automatically feeds cutting line when needed; our HT160i hedge trimmer, featuring 16 inch dual-action, serrated cutting blades; and the B230i leaf blower, featuring 80 MPH air speed and 250 CFM of blowing force. The 3-in-1 interchangeable combination puts an arsenal of hassle-free tools in your hands. 20V Cordless Multi-Tool String Trimmer, Hedge Trimmer and Leaf Blower is rated 3.8 out of 5 by 25. Rated 1 out of 5 by DJ from I purchased this product in the summer and I thought at the time that it was the best purchase I ... I purchased this product in the summer and I thought at the time that it was the best purchase I made. This is my first time purchasing the Weed Eater product and I am very disappointed. The battery doesn't even last thirty mins. and it runs out though it was fully charged. If you ask me, the Weed Eater should stop telling us how sorry they are that we are not happy with the product, but they should mail a free battery pack to everyone. And the reason is that they have failed to test it first before they shipped it out. Rated 3 out of 5 by ANDY57 from QUIET AND LIGHTWEIGHT LAWN TRIMMER WORKS WELL. BLOWER NOT TOO POWERFUL. BATTERY RUNS OUT QUICK. EXTRA BATTERY IS ALMOST 1/2 THE COST OF THE 3 PC SET. Rated 3 out of 5 by ruschell from The products work really good. The only issues that we have occurred is the battery, even as ful... The products work really good. The only issues that we have occurred is the battery, even as fully charged, it does not stay charged long. Other then that great product! Rated 1 out of 5 by Sparky from Disappointed with the battery I bought this yesterday after owning a weedeater for several years. Charged the battery as instructed, used the trimmer for about 15 minutes. Battery indicated flat, charged for 13 hrs to no avail. Taking it back in the morning. So disappointed! Rated 4 out of 5 by Tamiami1 from I love it BUT you need more Batteries I love the 3 in 1 combo, BUT the battery does not last more than an hour. If you want to finish all of your yard work without waiting for the battery to recharge then you need to purchase 2-3 battery packs. Of course Weedeater is out of stock on the battery packs and with a shipping charge it will be another $70 out of your pocket. Rated 3 out of 5 by Steve from I love the 3 in 1 combo, but it would be nice to have an extra battery to purchase. I gave it 3 s... I love the 3 in 1 combo, but it would be nice to have an extra battery to purchase. I gave it 3 stars because I can't find a battery anywhere and end up using my corded equipment to finish the job. Rated 4 out of 5 by deann from Ok, for small yard, wish I could get another... Ok, for small yard, wish I could get another battery. I trim, charge, mow and blow, the blower is not strong, the weed whacker is hard to figure out how to get best angle, there is only 1 string. I haven’t tried the pruner yet.